This sounds pretty fancy, doesn't it? It tastes fancy, but is probably one of the easiest things to make and one of our new favorite pasta dishes. Fresh basil is my new best friend and combined with lemon? Yummy. It is one fabulous herb. This butter sauce is lighter than you would imagine and makes you feel like you're eating at a classy restaurant. But of course, it's always better to be eating at home in your comfy clothes. 1. Bring a large pot of water to boil. Add a pinch of salt and cook ravioli according to package instructions. Drain and set aside. 2. While the ravioli is cooking, make the butter sauce. In a small saucepan, melt the butter over medium heat. Stir in the lemon zest, lemon juice and basil. Cook for an additional 2 minutes. Season with salt and pepper, to taste. 3. Pour the ravioli in a serving bowl. 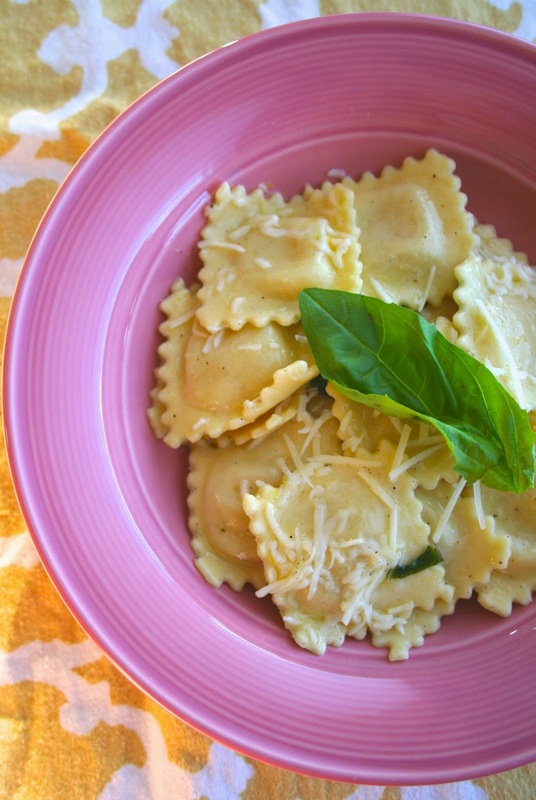 Pour lemon basil butter sauce over the ravioli and stir gently to combine. Garnish with Parmesan cheese and extra basil, if desired. Serve immediately.